BHOPAL: An elderly woman in Bhind of Madhya Pradesh has gone into a shock and fallen sick after she was ordained by a local panchayat to stay out of village and beg for seven days. This decree came from the panchayat after the woman accidentally killed a calf three days ago. The woman from Bhind town has been hospitalized in an unidentified location by the family members fearing the anger of the panchayat. Earlier, the old lady was sent to her daughter’s village Porsa in Morena. Her condition deteriorated there and she was admitted in Bhind’s district government hospital, but later shifted from there too. According to sources, the calf was accidentally killed after Kamlesh Devi, 55, resident of ward no 39 of Bhind hit it with stick. She was milking the cow on August 31 when the calf reached there to get a feed. Kamlesh Devi tried to get it separated from cow, but failing, she hit it. When the members of the community came to know of the incident they immediately called Panchayat and decreed that Kamlesh Devi had murdered the calf and therefore she would have to beg outside village for 7 days. She would also have to take bath in Ganga and after that after returning to her home she would have to feed young girls than only she would get rid of the sin of killing calf. Kamlesh got terrorized by the order and her son Anil took her to his sister’s village and left her there. When the Panchayat came to know that she did not ‘obey’ them and rather ‘insulted’ them, Anil was asked to bring her back. But soon after returning she got fainted due to that she was rushed to Bhind hospital and was admitted. 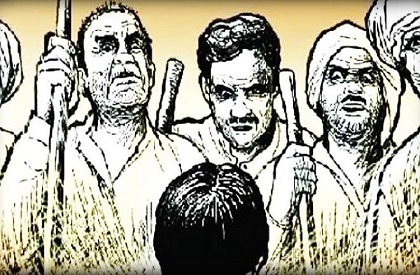 However, the Sarpanch of the Panchayat said no such decree was issued and the lady decided the punishment for herself. SP Bhind Anil Singh Kushwah said an inquiry has been ordered and action would be taken against whosoever is found guilty.